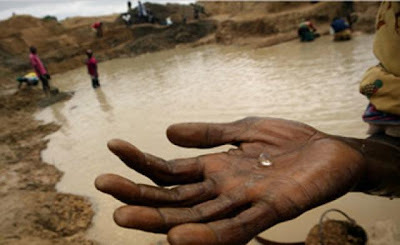 UAE joins the international ban on the trade of ‘blood’ diamonds coming from Marange fields in Zimbabwe, Arabian Business reported on Thursday. Dubai Multi Commodities Center (DMCC) said that the UAE has signed the U.N.-backed Kimberly Process, which controls the misuse of trading the rough diamonds to feed conflicts. The Marange fields, which were seized by Mugabe government in 2006, are located in eastern Zimbabwe, and have the largest-known concentration of diamonds in the world. Reports have linked Marange’s profits with human rights abuses and violence, and suggested that Zimbabwe President Robert Mugabe has profited from illegal trade stemming from the fields. Early December, a cable from the U.S. Embassy in Zimbabwe leaked by Wikileaks alleged much of the trade passed through the Gulf. In a statement, the DMCC said diamonds from Marange would no longer be permitted. Other signatories include the UK, US, India and Australia.